Hi, I am interested in your 1968 Jeep Commando (stock #MHM3149) listed on Autotrader for $15,900. I'd like to get more information about this vehicle and confirm its availability. 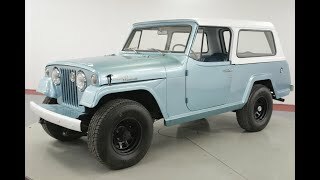 The Jeepster Commando is an automobile which was first produced by Kaiser Jeep in 1966 to compete with the International Scout, Toyota Land Cruiser and Ford Bronco. Four different models were available: a pickup truck, convertible, roadster and wagon. The Kaiser line remained in production until about 1969, when American Motors Corporation (AMC) bought Kaiser in 1970. After AMCs acquisition, the Jeepster Commando C101 (101 wheelbase) steadily grew in popularity. In 1972, AMC shortened the vehicles name to Commando C104, extended the wheelbase to 104, and changed the front-end design to accept the AMC I6s & V8 304ci, similar to the Ford Bronco. The new configuration, formerly an AMC best seller, quickly caused the line to drop in popularity and was taken out of production in 1973; it was replaced with the full size Cherokee. The Jeepster is an ancestor of the modern Jeep family produced by Chrysler.